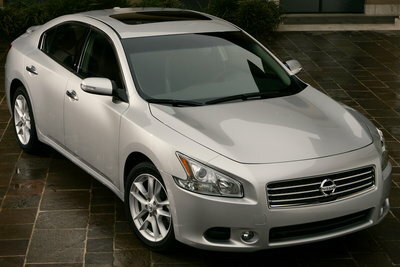 The Maxima has long been the flagship sedan of the Nissan lineup. Unfortunately with the rise in sales and stature of the Altima, Nissan has struggled to differentiate the Maxima from the Altima and the higher performance models of the Infiniti brand. Thankfully, the latest generation Maxima is striking off in a more stylish and sporting direction. The FWD sedan offers just one powertrain: a 290-bhp, 3.5-liter V6 coupled to a CVT transmission. Two trim levels are offered: S and SV, both are well equipped. An optional dual pane sunroof is similar to the one in the Murano. The stylish exterior and interior along with the slight increase in horsepower should lure some buyers that are not interested in the more mainstream Altima. Nissan's all-new Maxima wears more striking sheet metal. The interior has been reworked and now bears a stronger resemblance to Nissan's upscale Infiniti products. By switching to Nissan's D platform, the Maxima gains a couple of inches in width and loses almost four inches in length, which should aid handling. The reduction in length reduces the legroom in the rear seat. Although the powertrain remains the same, the output of the 3.5-liter V6 has increased by about 35-bhp and 10 lb-ft of torque. The Maxima retains its CVT transmission but adds a new Ds mode for sportier shift feel.